For everyone who loves Jane Austen . . . the second tantalizing mystery in a new series that transforms the beloved author into a dazzling sleuth! Jane and her family are looking forward to a peaceful holiday in the seaside village of Lyme Regis. Yet on the outskirts of town an overturned carriage forces the shaken travelers to take refuge at a nearby manor house. And it is there that Jane meets the darkly forbidding yet strangely attractive Mr. Geoffrey Sidmouth. What murky secrets does the brooding Mr. Sidmouth seek to hide? 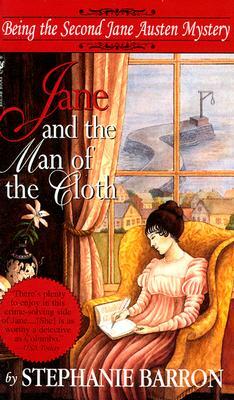 Jane suspects the worst—but her attention is swiftly diverted when a man is discovered hanged from a makeshift gibbet by the sea. The worthies of Lyme are certain his death is the work of “the Reverend,” the ringleader of the midnight smuggling trade whose identity is the town's paramount mystery. Now, it falls to Jane to entrap and expose the notorious Reverend . . . even if the evidence points to the last person on earth she wants to suspect . . . a man who already may have won her heart. Stephanie Barron is the author of eight previous Jane Austen mysteries. She lives in Colorado, where she is at work on the next Jane Austen mystery.